Editor’s Note: Here’s what no one is saying openly: when it comes to customary and reasonable fees, the Interim Final Rule released last October is not in the spirit of the Dodd-Frank legislation it is intended to implement. Congress, recognizing that quality reports are dependent on paying appraisers “fairly,” wrote a customary and reasonable fee provision into Dodd-Frank, and going further, stipulated that any independent studies to determine such fees should specifically not take into consideration fees paid by appraisal management companies (AMCs), suggesting their acknowledgment that AMC fees are artificially low. The Board has collected comments from appraisers and will release a Final Rule, on or before the April 1, 2011 implementation date. 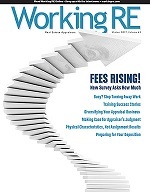 Over 8,100 appraisers have completed the OREP/Working RE Customary and Reasonable Fee Survey and at least that many have viewed the results, which are now available free at WorkingRE.com, Surveys (the survey is closed). WRE has not received a single complaint disputing any of the results. The take away may be that appraisers completed the survey truthfully and in good faith and that, within a range, there is fairly broad agreement among appraisers about what is customary and reasonable in a specific market area for a particular report. Indeed, you will find the survey results to be largely clustered in the same fee categories for a given product and area. This is not to suggest that “setting” fees or restraining competition is appropriate but it does seem to support the notion that a baseline fee structure as per Dodd-Frank is possible. The truth is, most appraisers have adjusted to the new world and many have more business than they can handle at the moment, even if they are working harder and longer for less money. That said, it does not mean that the current situation is good for the profession or the public, who is overpaying for appraisal services and may be receiving reports of diminished quality due to fee and turnaround time pressures, according to results from the Working RE/OREP HVCC Talkback Fee Survey (HVCC Hits: Appraisers Talkback, at WorkingRE.com, Library, Issue 22). AMCs are evolving and the best will survive. Some leverage will swing back to appraisers as their ranks continue to thin and those with unique knowledge and expertise find their services in higher demand. Communication between AMC staff and appraisers will improve as things become more standardized and fees will rise for appraisers who position themselves correctly. But if you’re an appraiser, it would be nice to have the intent of the law enforced today. You can find the Interim Final Rule 2010 at WorkingRE.com, Sidebar Info.